A Dumpster Lens . . . Will it Make a Telescope? Thread: A Dumpster Lens . . . Will it Make a Telescope? I found a lens while Dumpster diving, a few years ago, and saved it from the land fill. Ever since then, I have wondered if it would make a telescope. It was made by Kowa. It is mounted in a black, anodized housing and weighs almost 4 pounds. The barrel is marked: 1:0.95/90. If I am interpreting these figures correctly, the lens is f/0.95 and 90mm diameter? That should be about 94mm focal length? The exit window is about 35mm in diameter. Oops! Is this a 35mm camera lens? If I hold this thing up and look at the back of it with a 10X loupe, I get a nice, crisp, inverted image about 4cm away. This is too close for any kind of focus mechanism I have seen on a telescope. I could cobble something together in a plumbing supply store, maybe. So, do the optics in this thing look like telescope material, or should I just heave it back into the Dumpster from whence it cometh? j.gardavsky, ozeclipse, Gabby76 and 1 others like this. Re: A Dumpster Lens . . . Will it Make a Telescope? if the optics of the lens is o.k., I mean no scratches, no fungus, I would keep it. The lens is most highly likely not suited for making a telescope, it might have been a part of some tactical optics. Similar lenses used to be known from Rodenstock tactical optics, but I am not sure if Kowa makes anything alike, even if they make sports optics, and used to make camera lenses, etc. The barrel is marked: 1:0.95/90. If I am interpreting these figures correctly, the lens is f/0.95 and 90mm diameter? That should be about 94mm focal length? The exit window is about 35mm in diameter. Oops! Is this a 35mm camera lens? If it is indeed f/0.95, the focal length will be 85.5mm. You could make a telescope out of it, but a focal ratio that fast is unlikely to have a focal "plane" that is anywhere close to flat. But you have nothing to lose trying it. Establish the focal length first. The safe way to do so is to focus an image of the Moon onto a piece of paper. The unsafe way is to focus an image of the Sun onto a piece of paper. I don't recommend that! 85mm doesn't leave a lot of room for an adapter. You have only 30mm to get it down to a T-thread for a DSLR, for example. Good luck with it! If you can get it to focus on a sensor, it will be wicked fast! I made a scope out of a surplus photocopier lens. It was 70mm aperture, 230mm focal length, f/3.2. I was able to adapt it to a DSLR and take some nice images of M31. It had a lot of negative coma, though, due to the un-flat image field. Gabby76, burris and The Happy Parrot like this. In addition to the problems outlined above, telescopes have a property call the exit pupil. If the exit pupil of the telescope is greater than the entrance pupil of the eye, the light doesn't reach the eye. The maximum eyepiece you could efficiently use with this scope would be a 6-7mm eyepiece. A 25mm eyepiece would have an exit pupil of 27mm and your eye could only accept 7% of the light output turning the 90mm aperture into an effective aperture of just 12mm. Look at a bright star at night and look at the image quality. Also look at some faint areas of stars and compare the view to small binoculars. That should tell you. A 7mm eyepiece would give you a 13.5 magnification and a 6 degree field of view with a 7mm exit pupil however the field is likely to be very curved as already mentioned. Thanks for the information, folks. I will keep an eye out for hardware to mount this lens and adapt an ocular to it. I hate to see a piece of gear like this go to waste. It had to cost somebody a ton of money. To just throw it away offends me. If you could cobble together some plumbing parts to build this into a scope it may be only a simple "Pirate" spyglass. But hey, at least you'll have a Pirate spyglass, Arrrggggh! I don't think this will make a good pirate's "bring 'em near". The lens is about 100 mm wide and just barely the same dimension lengthwise. Add an ocular lens to the back and the pirate would have to have one of the swabs carry it for him. JG, The company that used the lens had nothing to do with any "tactical" function. It was making medical imaging equipment. One of the engineering departments was getting rid of some prototype equipment and the lens was in a pile of that stuff that was thrown out. 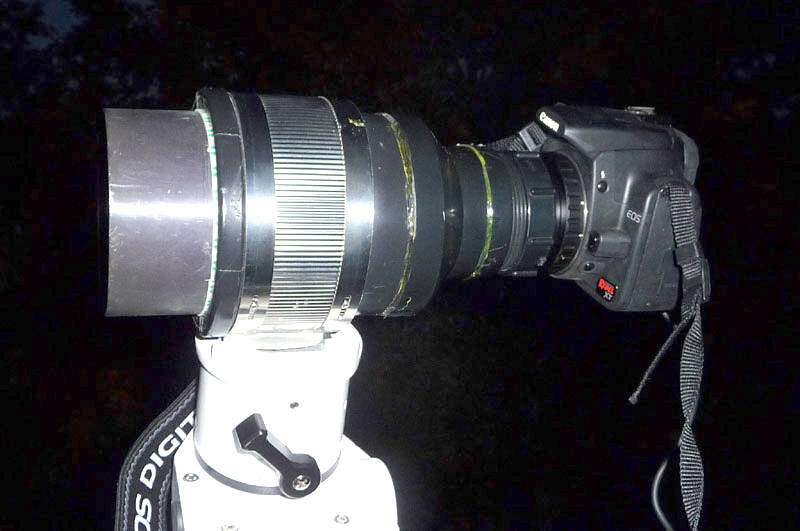 The small end of the lens was poised over the output of an image intensifier. The big end was pointed at a turret containing a cine camera, a 35mm camera back, and a digital imager. I think that whatever the image was, going in or out, it was pretty darned flat; these guys didn't spare the money when they designed something. j.gardavsky and jaetea like this. this about the lens sounds pretty interesting. If the field is flat and it was designed for imaging, you could use a DSLR and a 2x teleconverter to make yourself a 180mm f1.9. At 90 f0.95 you'll probably get a lot of vignetting. For visual, my original recommendation of a wide angle 7mm eyepiece giving you 13.5x and a 7mm exit pupil. A 13.5x 90 monocular pretty nice. A 50 deg Plossl eyepiece will give you a 4 deg field, a 68 deg eyepiece a 5 degree field and an 82 deg eyepiece a 6 degree field. This is the "copyscope" that I made. The plumbing parts (~$20) cost more than the lens did ($10). The camera end terminates in a 2" trap adapter, which nicely accepts the 2" zero-profile T-adapter attached to the camera. jaetea, kingclinton, ozeclipse and 2 others like this. What make of lens ? 2 biconvex lens (2,3cm and 6cm diameter) can make a telescope? How to make a minolta shoot without a lens?